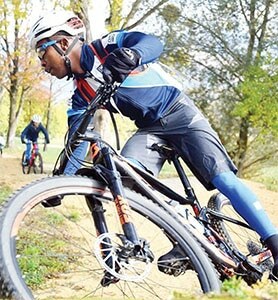 MASERU – Lesotho’s 2019 Olympics hopeful, Tumelo Makae, finished second at the Western Cape XCO Series in Cape Town, South Africa last Saturday. Makae, 22, who is currently based in Paarl, South Africa, at a world cycling centre where he relocated to in January to intensify his preparations for the upcoming Tokyo Olympic Games, clocked in at 01:30:12 at the race. He came in behind South Africa’s former junior champion Johann Trotzky who crossed the finish line in 01:29:29 at the six-lap Western Cape elite men cycling event. 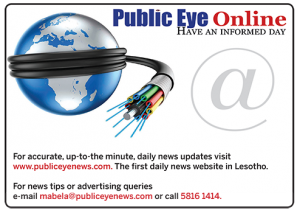 Hot on Lesotho’s top cyclist’s heels were Ryan Lenferna and Craig Boyes in 01:30:41 and 01:31:36 on third and fourth positions respectively. Makae outperformed 10 riders who cycled to the finish, including Craig Boyes and Michard Meets who appeared on fifth and sixth-places, registering 01:35:50 and 01:38:31 respectively. Some of the other top riders could not finish the race, comprised Bruce Anderson, Michael Sutton and Lesotho’s Lichaba West who all lasted five laps, while Jan-Hendrik and Rossouw Bekker lasted for three and two laps respectively. Makae’s manager at ACE-The Sufferfest MTB Team, Mark West, said although the Western Cape XCO Series was not an International Cycling Union (UCI) class event, but it benefitted his rider a lot. “Although it was not a big race and not an UCI class, but it offered good experience to Makae,” West told Public Eye on Monday. Makae, however still has to qualify for the Olympic Games and for him to book a place at this global showpiece he will have to meet UCI standard qualification during next month’s African Championships scheduled for Namibia, for the African riders. Last month, Makae and his local racing partner Phetetso Monese won the International Cross-border Mountain Bike 3 Stage Race. 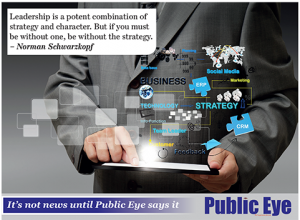 The circuit event took place from February 22- 24, from Ficksburg in South Africa to Maseru, Lesotho and competitors were drawn from the two neighbouring countries. At the Paarl centre, Makae is training with among others SA Commonwealth bronze medalist, Clint Hendricks under the mentorship of former top SA professional track cyclist, Jean-Pierre van Zyl. Before relocating to South Africa, Makae was in Switzerland where likewise he was intensifying his preparation for the Tokyo Olympic Games and the 2016 Commonwealth Games. He was in Switzerland from 2016 until December last year. West said in Paarl where he will remain until the end of April, Makae has mostly been doing road training and racing to build his speed and endurance.